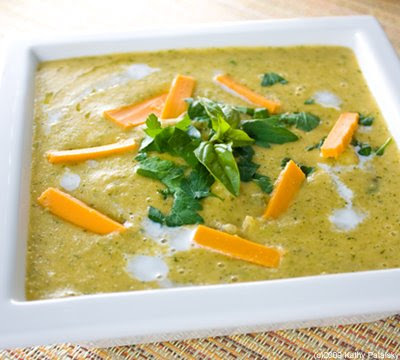 Spicy Broccoli Cheddar Soup. Yes, it's Vegan. It's a common code among healthy cooks everywhere: when you find a veggie that your 'vegetable-shunning' kid, client, customer, husband or wife actually likes-embrace it! Recently my husband confessed his adoration for broccoli in the form of Broccoli Cheddar Soup. 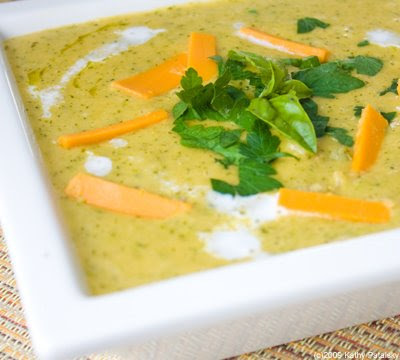 So since broccoli is one of the healthiest veggies around, I knew I wanted to wow him with this broccoli-dense cheesy-goodness soup. I even tossed in a jalapeno for a little spice! A Lot Creamy. A Little Chunky. 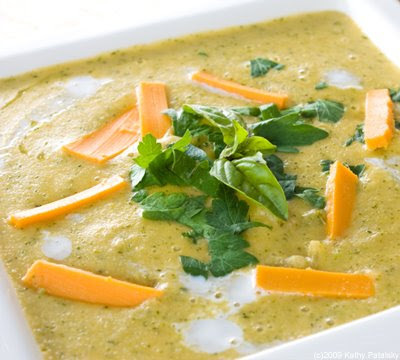 I like my broccoli soup creamy smooth, but I also love to get a few bits of whole chunky broccoli bits. So that's how I make it, a little chunky, a lot smooth. You'll need a food processor or "Vitamix" style blender. 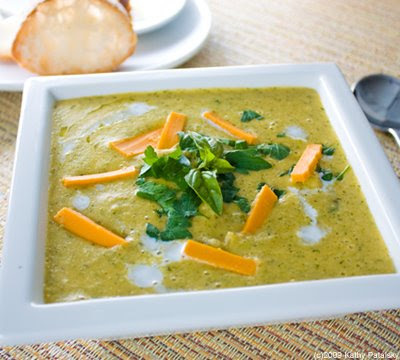 I actually made this soup with my Oster Fusion blender. 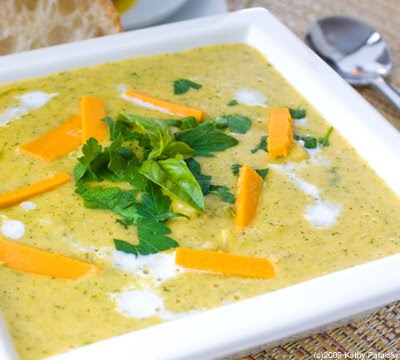 *There are numerous ways to make this soup-but these basic ingredients will help you succeed. 1) Chop your broccoli-including most of the stalks-don't throw them all away! Leave out about 1 1/2 cups of tiny broccoli florets for adding whole to the soup later. The rest of the broccoli will be pureed. 2) In your soup pot, saute over med-high heat: 2 Tbsp of your olive oil with the shallot, onion and jalapeno. When cooked lightly, add in lemon juice, veggie broth, remaining oil, cheddar cheese, salt and pepper. Reduce heat to medium. 3)Bake your potatoes using an oven or microwave. Rough chop them and add them to your pot. 4) Add in the broccoli. Remember to leave out a few florets for later use though. 5)Cover with lid, when broccoli is tender, turn heat off. 6) Transfer contents of pot into a large mixing bowl. Allow to cool slightly. Add to the bowl the fresh parsley, soy creamer, vegenaise and soy milk. Fold new ingredients into the hot soup mixture. 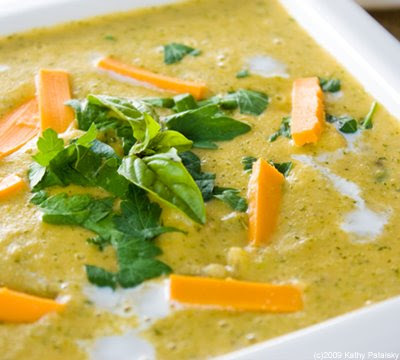 7)In batches, puree the soup in a Vitamix or other food-processor style blender. 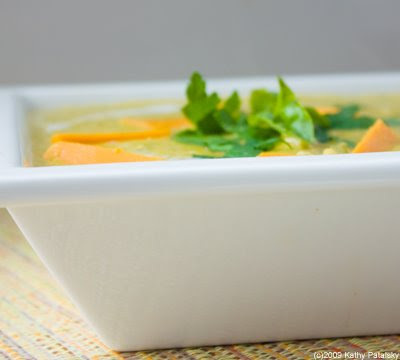 Soup should be smooth-no lumps or chunks. Warning: only blend warm soup in blender with extreme caution! Never aim blender toward your face and always start on the lowest setting possible. Never overfill the blender. 8) In the soup pot, add the broccoli florets, a dash of veggie broth and saute covered for about a minute until tender. 9) Add the pureed soup back into the soup pot. Add a bay leaf and a few pinches of chopped basil (optional). 10) Simmer uncovered for at least twenty minutes to cook out all the air bubbles. Stir constantly for the first few minutes. Remove the bay leaf before serving or storing. 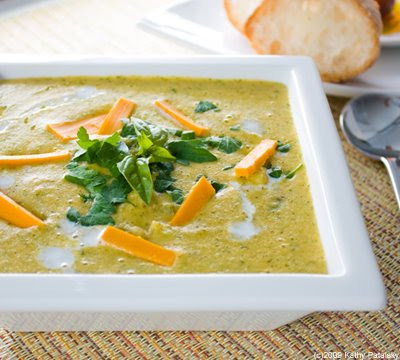 11) Serve with a garnish of 1 tsp soy creamer drops, a pinch of fresh parsley, a basil leaf and of course some shreds of cheddar cheese. Lower Fat Modifications: Use half the amount of olive oil, and substitute the creamer for more soy milk.